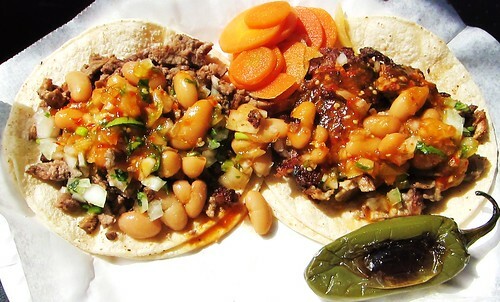 La Isla Bonita is a popular Venice Beach taco truck that parks on Rose Ave just west of 4th St. Parking can be difficult and if it’s the lunch hour there is likely to be a line and about a 15 minute wait for your food. 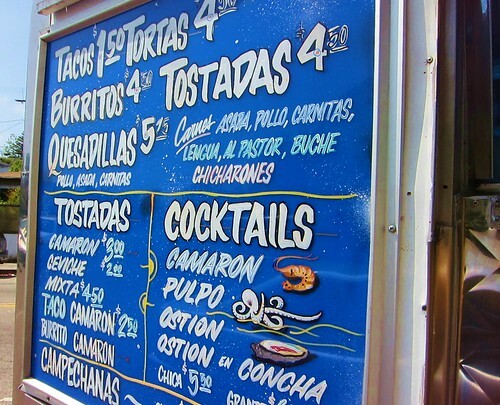 The mariscos are the most popular items here : the shrimp cocktail and shrimp tostada are superior to La Playita, another popular mariscos and taco stand on Lincoln Blvd. The tacos are topped with onion, cilantro, a mediumly spiced chile arbol salsa and pinto beans. The beans add a little character to the taco. 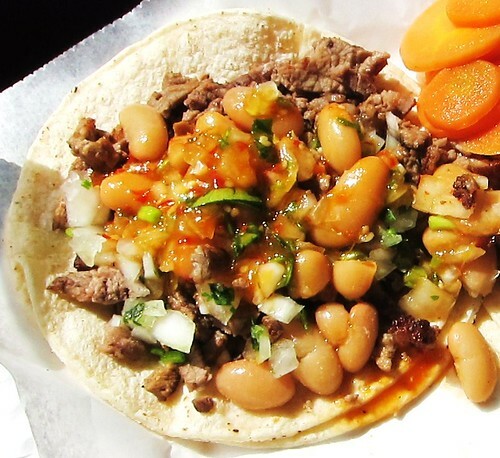 The flavor of the beans are too subtle to counter the chile or the meat but they do add something interesting to the taco. The carnitas is crispy at the edges with soft porky flavor in the middle. The carne asada is finely chopped and lightly seasoned. There are no loose bits of fat and the beef is very understated. On it’s own the beef would be too bland but when you add all the other ingredients together combined with how fresh and hot the tacos are the weakness of the meat is disguised. At $1.50 the tacos are pricier than most taco trucks but when you get this close to the beach everything seems to be marked up. I usually get a couple of tacos to go with some mariscos. Either the shrimp tostada, which is loaded with shrimp and slices of avocado, or a shrimp cocktail. With a cold bottle of Mexican coke this combo is hard to beat. Especially on a hot summer afternoon. Not too crazy about the beans, A good taco. 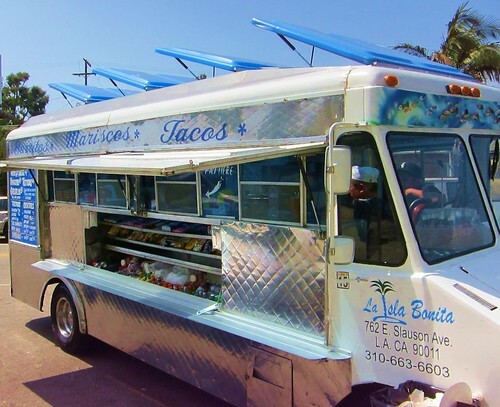 I prefer the La Playita, truck on Glenco near the Dr. Schultz for my Venice taco fix. The real winner at this truck is the ceviche tostada. Everything is great though. The ceviche tostada is mindblowingly good. Get it to go and they give you the filling separate in a container with an extra tostada, in case one breaks on the way home. I agree with you regarding the blandness of the meat in the tacos. Overall, go for the ceviche, and if you're still hungry, grab an asada taco or two.